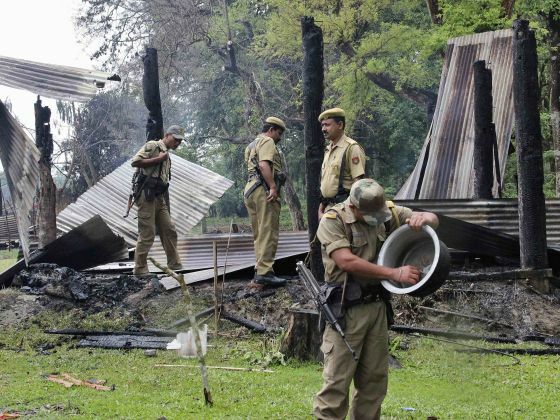 JNN 04 May 2014 BARAMA: India deployed troops to the state of Assam on Saturday after 31 Muslims were gunned down in three days of what police said were attacks by tribal militants who resented the presence of immigrants from neighbouring Bangladesh. The unrest in the tea-growing state comes towards the end of a marathon election across India that has heightenedethnicandreligious divisions. 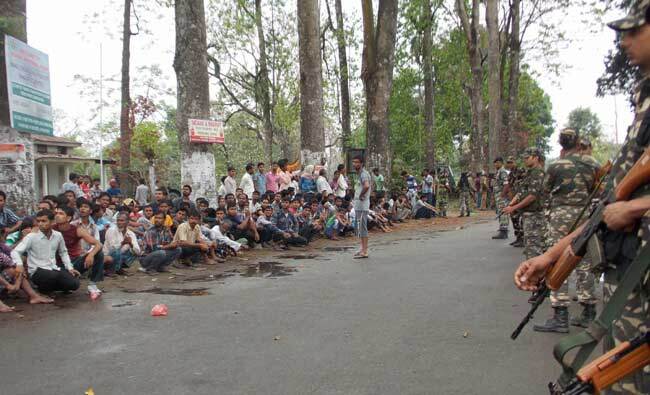 Security forces found the bodies of nine people with bullet wounds on Saturday, six of them women and children, the third day of violence that police blamed on Bodo tribesmen attacking Muslim settlers as punishment for opposing their candidate in the election to the Indian parliament. Bodo people are followers of the local Bathouist religion. `We are scared to live in our village, unless security isprovided by the government,` said Anwar Islam, a Muslim who had come to buy food in Barama, a town about 30km from the villages in the Baksa district where the violence erupted on Thursday and Friday. He said men armed with rifles had come to his village, Masalpur, on bicycles and had then fired indiscriminately and set huts on fire. Bodo representatives say many of the Muslims in Assam are illegal immigrants from Bangladesh who encroach on ancestral Bodo lands. In 2012, clashes erupted in which dozens of people were killed and 400,000 fled their homes. In addition to that violence, Assam has a history of sectarian strife and armed groups fighting for greater autonomy or secession from India. Election candidates, including the BJP`s Narendra Modi, the front-runner for the post of prime minister, have been calling for tighter border controls. On Saturday, the ruling Congress party blamed Modi of using divisive rhetoric. `Modi is a model of dividing India,` said Law Minister Kapil Sibal. Modi said last weel( that illegal immigrants from Bangladesh in the nearby state of West Bengal should have their `bags packed` in case he came to power, accusing the state government of being too soft. `Modi should have been more responsible in his utterances,` said Sabyasachi Basu Roy Chowdhury, a political science professor at Rabindra Bharati University in Kolkata. `His words can be very damaging since, even if we consider that Bangladeshis are living here illegally, there is a question of human rights too. But the BJP said it was the responsibility of the Congress party that governs the state to ensure law and order and crack down on militants. Soldiers in convoys of trucks mounted with rifles were patrolling on Saturday in Baksa district, where some of the attacks took place. Bodies covered with white sheets were laid out in a row at a police outpost on the edge of Barama for identification by relatives. Most Muslims were staying together in big groups, villagers visiting the market in Barama said. Security forces found three children hiding in forests near the border with China. The Bodo region faces what residents say is a tight race between a Bodo and a non-tribal candidate. A policeman was killed during the voting when the region went to the polls on April 24. The Successive Hindu Governments of the so called Secular India , has never been Merciful towards Muslims , of which Sub Continents Muslims have been the Main Target , for adding up to their Miseries and Chaos by the Indian Governments . The Picture framed by the Indian Government is very Secular, But if you check on the realities , then whether it is the Matter of Killing of Muslims in Gujrat by the Groups Sponsored by the then Chief Minister Narindra Modi , or the Killing of Muslims , by Extremist Hindu Agents of RAW, in the Burning of the Samjhota Express, or the Killing of the thousands of Loyal Pakistanis by Indian Agents in the form of Mukti Bahani in the East Pakistan , ( Now Bangladesh ) , which they created in the hatred of Muslims Power in the Region, as being the Biggest Islamic Country of the World , and till now the Bangladeshi are in trouble , as the Present Killing of the Bengali Migrants , in the indian Province of Assam . is yet another example of Hindu Hatred towards Muslims. It is the same India which have been ruled by Muslim Mughal Emperors for over thousand years , and during their rule they created an atmosphere of Peace & Harmony for the religions Present in the Sub Continent , and it was so Peaceful and free , that even New Religions like Sikhism , also came into being and Nobody tried to Hinder or Black out it , and No Injustice was done towards them , rather to keep Peace and Harmony and Peace among the Hindus and the Muslims the Mughal Emperor Akber even crossed the Red Line and even tried to create a Religion , “ Deen e Elahi ” to accommodate the Members of all the communities Under One Umbrella and One Religion. Already Won and the Strategic Positions already conquered . And all this at the cost of the Brave Pakistani Soldiers Blood , which was spilled due to the Orders of retreat of then Prime Minister Nawaz Shariff , who was ordered By his US Master to Retreat , or face the Music of Dethroning . Who are still in the same stance , trying to give the Hindu Neighbors the Best he can offer , or rather the Best they want , at the cost of the Innocent People of Pakistan , who are Once again been Lured into the Hindu / Anti Islam Propaganda Film Industry , which is against the Pakistani Culture , Religion , and Ethics . This entry was posted in Asia Pacific, Jafria and tagged Bangladesh, Bengali, Chief Minister Narindra Modi, communal violence, Hndu - Muslims Riots, illegal immigrants, Immigrants, india, Muslims, Narendra Modi, sectarian clashes, Secular India. Bookmark the permalink. A detailed Research and Analysis on the Myth of Illegal Immigration of Bengali Muslims from Bangladesh into Assam and Massacre of Innocent Muslims in Bodoland.